Only 30 places left! ENTER NOW! The re-birth of our ‘good old’ Bikefest has gone really well with only 30 places being still available for the 2018 edition of the Bikefest. So, if you are interested in coming along and race our 6-hour event or ‘The Steve Worland Ride Singletrack Hard & Drink A Swig of Cider Per Lap Memorial Cup’ then make sure you jump onto our entry page now to secure your entry. We will have no day entries at the event and will close the entry as soon as we have reached our maximum for 2018. If you haven’t entered yet why not consider racing the ‘The Steve Worland Ride Singletrack Hard & Drink A Swig of Cider Per Lap Memorial Cup’. The event is only a few minutes shorter than the main race but you are racing for a good cause and in memory of a Bristol mountain bike legend…and you also get a bit of a drink every time you pass our cider station…sounds good, doesn’t it? We also could do with a few more entries to our kid’s events. If you know that your kids will be racing at the event, please make our planning easier by entering them now. If you can’t commit that far in advance – fear not the kid’s events (contrary to the main races) will have the option to enter on the day. To find out more about the Bikefest, please check out the event website www.bike-fest.com. Friends and supporters of the Bikefest 2018 – Chalet-Hotel Starlight, Morzine will be at the fest in June to talk to people about their latest offering and invite everybody to get involved in a great competition. 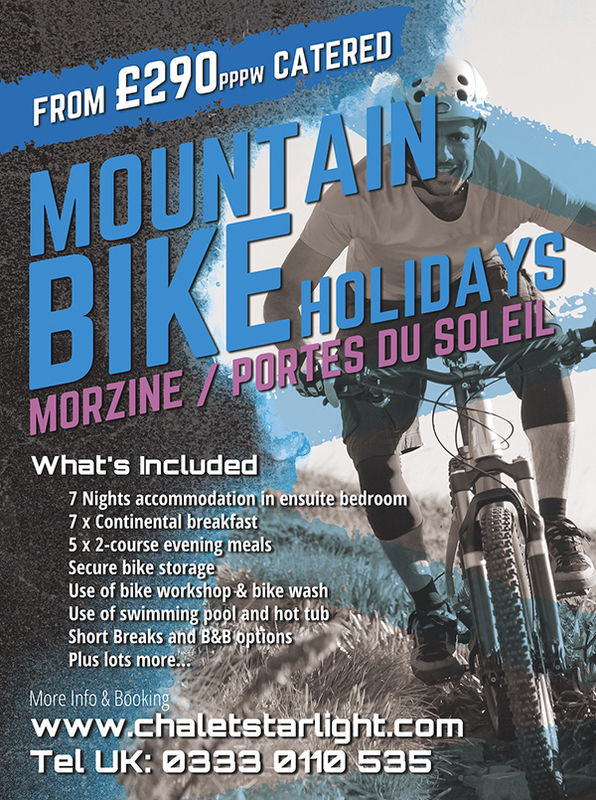 The guys are providing comfortable MTB specific accommodation offering value for money in a fantastic location close to the centre of Morzine. It is possible to ride directly back to the Hotel from the Pleney tracks. Rooms are ensuite and available as half-board or B&B plus they offer flexible arrival and departure dates. Prices start at just £290 per person for a week catered – all summer! Bike workshop / cleaning facilities / secure storage / swimming pool / hot tub / bar / ensuite bedrooms. Check it out and make sure you say hello to them at their Bikefest stand in June! Previous PostPrevious …you have probably heard it…we are back! Next PostNext Want to see the 2018 Bikefest course?